VEI is leading the FDW project “Performance Enhancement of Water utilities in Kenya (PEWAK) through benchmarking, collective learning and innovative financing” (FDW14KE13). 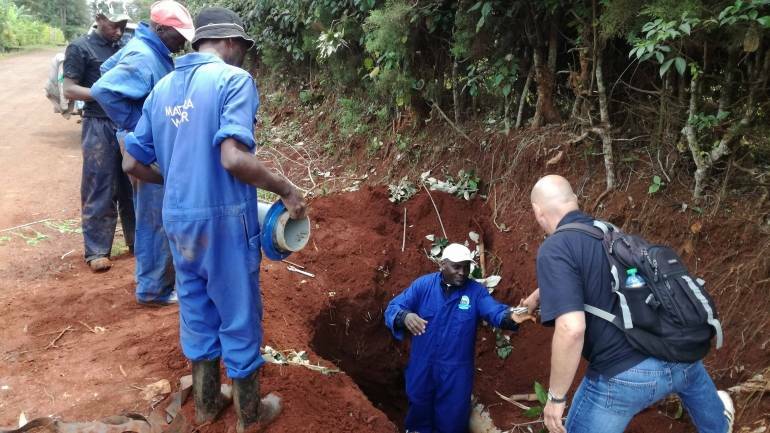 This project is financed by the Netherlands Enterprise Agency under the Sustainable Water Fund (Fonds Duurzaam Water, FDW). The project started 1 January 2015 and runs till 31 December 2019. The purpose of the project is to improve the performance of Water Service Providers (WSP) through benchmarking and peer-to-peer learning, the implementation of NRW reduction plans (10 WSPs), and improved service delivery to the urban poor (10 WSPs). 1. Benchmarking of Kenyan water utilities up-scaled to at least 25 participating WSPs, to facilitate ongoing peer-to-peer learning and continues performance improvement. The topics of the benchmark are non-revenue water (NRW) reduction, cost recovery, service levels and pro poor services. 2. Water and sanitation services in Low Income Areas improved by training of pro poor coordinators, development of pro poor strategies to increase water services to the low income areas. And implementation of infrastructure projects to supply 100,000 people with improved water. 3. NRW reduction at 10 WSPs through the creation of District Metered Areas covering 51,000 connections and implementing measures to reduce NRW. The investment plans for NRW reduction at these 10 WSPs are developed as bankable proposals suitable for blended or commercial financing. Introduction of innovative techniques and contracting (e.g. performance based contracts) in the efforts to reduce NRW. VEI, on behalf of Aquanet, is the lead partner in the Project. The supporting partners are: Water Services Regulatory Board (WASREB), Water Services Trust Fund (WSTF), Water Services Providers Association (WASPA), UNESCO-IHE, SNV Netherlands Development Organisation. Ten Water Services Providers (WSPs) are the main beneficiaries of the results of the Project: Mathira, Kericho, Kakamega, Kisumu, Nakuru, Nakuru Rural, Malindi, Kikuyu, Murang’a, Bomet.